The 2075 RAMI pistol is manufactured by Česká zbrojovka Uherský Brod which is based in the Czech Republic. 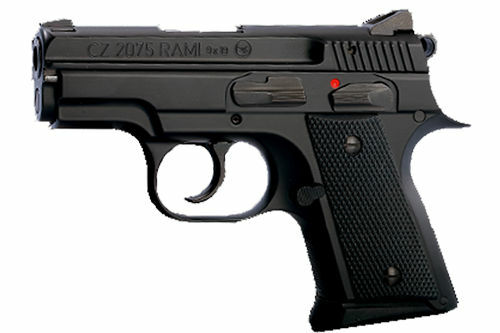 The company is more commonly called CZ here in the US, and they introduced the 2075 RAMI in 2007. The RAMI was designed by two CZ arms designers named Radek Hauerland and Milan Trkulja. The RAMI name comes from combing the first two letters of each of the two designers first names. For all intents and purposes, the RAMI is a scaled down version of the uber popular CZ 75 series of pistols and was designed specifically for concealed carry. 2075 RAMI – This was the “standard” RAMI model which was built on an alloy frame that was mated to an alloy slide. 2075 RAMI P – This was the polymer version that mated a polymer frame to an alloy-based slide. CZ discontinued the polymer framed “P” series 2075 in 2011. Both frame variants of the RAMI were chambered in either 9mm or S&W .40 caliber. The pistol capacity is dependent on the caliber and magazine configuration. The 9mm version comes standard with a 14 round magazine and a 10-round version for use in capacity restricted states. The .40 versions came equipped with a 9 round standard magazine and a flush fitting 7 round version. CZ stopped production of the .40 caliber version of the RAMI in 2016, so the 2075 RAMI is only being produced in 9mm these days. Like the CZ series, the 2075 RAMI is a true double action/single action pistol, meaning it can be fired in either a single action manner or as a double action on the first shot (after the first shot, the RAMI converts to single action). The standard 2075 RAMI model does not feature a decocker, so after a round is chambered, the shooter either must engage the safety and carry the pistol with the hammer cocked or depress the trigger and manually lower the hammer on a live round. As option number 2 wasn’t popular for some shooters, CZ also introduced a variant of the RAMI called the RAMI BD, which did feature a decocker. The 2075 RAMI series is currently only offered in two versions: (1) the standard 2075 RAMI, and the (2) 2075 RAMI BD series. From a size standpoint, the RAMI is very similar in size to a Glock 26 or Springfield XD SubCompact. The double stack grip is thick and chunky, and most shooters with above average sized hands find that their pinky hangs off the grip with flush fitting magazines. The alloy frame of the RAMI 2075 ends up weighing a little more than most of the polymer frame striker fired competitors, but the little bit of extra weight more than makes up for itself in recoil management and accuracy. Just a little tip: if you purchase or own a RAMI and are not 100% happy with the trigger, the CZ Custom shop can work wonders with the RAMI trigger. #1 – I see you offer holsters to fit the CZ 2075 RAMI, but don’t clarify if you fit for both the steel RAMI or the polymer version? I just picked up a polymer version (2075 RAMI P), and have read online that the frame on polymer versions is larger? According to CZ USA support, the steel version of the RAMI and the polymer version have the exact same dimensions and are the exact same size. As such, a holster made for a steel RAMI should fit your polymer model just fine. #2 – I have a 2075 RAMI BD model with the decocker. Can you fit a holster for it? Yes, any of the holsters listed below made for the standard RAMI, are made for the RAMI BD version. #3 – Do you offer or make a holster for the CZ 2075 RAMI in .40 caliber as I’ve heard that the .40 caliber versions are slightly larger in size compared to the 9mm versions? According to CZ USA support, the RAMI pistols in both 9mm and the now discontinued .40 caliber version are the same size so either caliber will fit a holster made for a RAMI in 9mm. #4 – Do you offer a holster with a thumb break made for the 2075 RAMI carried in the C&L (hammer cocked) position? Yes, we do offer holsters for the RAMI that offer an optional thumb break that is designed so snap closed with the RAMI in the C&L position. #5 – This page is supposed to be about holsters for the CZ 2075 RAMI, but I don’t see a RAMI pictured in any of the gun holsters listed on this page, so I’m confused? We try to photograph as many gun/holster combinations as possible, however we do not own every single handgun model on the market. As a result, we are not able to show every possible combination. The weapons shown in the holsters below are for demonstration purposes only. The holster models listed on this page are made to fit the CZ 2075 RAMI, even though the 2075 RAMI is not pictured in any of the holsters. #6 – What’s the best holster for a CZ RAMI BD? Any holster model listed below is available in a version to fit the CZ 2075 RAMI or the 2075 RAMI BD version.